You turn it on or wake it up every day. 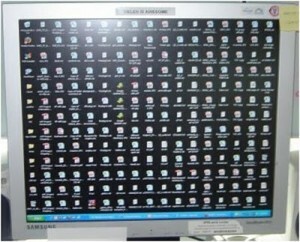 It has replaced your real desk top with a desktop full of icons representing folders, files and shortcuts to programs. I’m like you. I move my mouse and it wakes from its energy saving slumber. It greets me with a picture of my children, a dock leading me to programs I use most and items that I have deemed important enough to remind me of their presence every time I visit my desktop. How do you keep them organized? The most exciting and expanding part of the internet is “ORGANIZING”. Software that will help you keep track of the 12 different streams of information that you’re trying so desparately to keep updated and organized. It’s impossible to do with out some tools. Here are a few stories about organizers that will peek your interest, improve your organization and give you hope that one day all this technology could become more simple instead of more complex. Technology is supposed to improve our lives isn’t it? Contact management system to keep you and your business organized. Never forget a conversation or email again. Track all sorts of streams of information and even collect your own info from the noise that is social media. Good luck…and try to get organized. There’s hope if you do.